These three classic comfort foods can all be prepared ahead of time and reheated for meals and snacks on the go. You'll probably want to double the baked apple recipe, as it can not only be served as a side dish but also as a tasty snack, dessert, or even quick breakfast with a scoop of creamy Greek yogurt on top. Save the macaroni and cheese for a special occasion—it's rich, but a little goes a long way. Even if your kids profess to hate the sight of blue cheese, they will go nuts over this dish. This is a delightful spin on a comforting classic. Serve it with a large salad. Cook macaroni in boiling, salted water. Drain and set aside. Melt butter in a heavy-bottom saucepan. Whisk in flour and cook over low heat for 1 to 2 minutes, creating a blond roux. Add half of the half-and-half and whisk vigorously as mixture thickens to a smooth paste. Add the remaining half-and-half and whisk constantly, slowly bringing the sauce to a simmer. Cook for 2 minutes. Add three-fourths of the Monterey Jack cheese to the thickened half-and-half and stir to combine. When the cheese is melted, add milk, salt, black pepper, and cayenne pepper. Stir in half of the blue cheese and allow it to melt slightly. Remove mixture from stove. Pour the cheese sauce over the macaroni noodles and stir well to coat the noodles evenly. Pour into a casserole dish and sprinkle remaining Monterey Jack cheese on top. Bake for 15 minutes, and then sprinkle the rest of the blue cheese on top. Return to the oven and bake for another 15 minutes, or until the top is golden brown and bubbly. Remove from the oven and let set for 5 minutes before serving. 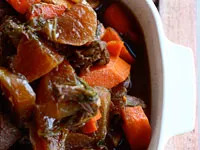 This stew does take a while to cook, but it's incredibly easy to throw together and can be done on a Sunday afternoon, for a whole week of delicious leftovers. The long cook time ensures tender, melt-in-your-mouth meat—comfort food at its finest! In a large Dutch oven, brown the meat in sesame oil over medium-high heat. Add soy sauce, sliced ginger, and garlic, plus just enough water to cover everything. Bring to a boil, then reduce heat. Cover and simmer for 30 minutes. Add carrots, radish, and star anise. Cover with the remaining water and bring to a boil. Reduce heat and cover and simmer for 3 hours. Serve over jasmine rice or noodles. Serve these with roast pork or chicken and greens on the side—I even like them reheated for breakfast the next morning! Preheat oven to 350°. Combine the pumpkin pie spice, dried cherries, walnuts, and brown sugar in a bowl and set aside. Pour apple juice into a glass casserole dish. Core apples carefully, making sure not to cut through the bottom. 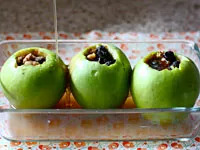 Stuff brown sugar mixture into each apple and set them in the dish. Mix together the maple syrup and melted butter and drizzle over the top of the apples. Cover with tin foil and bake for 40 minutes. Remove foil and bake for an additional 20 minutes, or until apples are tender.